AUTHOR'S NOTE: A while back, a customer emailed me, frustrated he couldn’t find a 1991 Corvette Black Book to complete his collection. He was relieved to learn there was no 1991 edition...we skipped that year. This, and other inquiries, made me realize a complete list of the books I’ve authored was needed. Corvette and Camaro enthusiasts don’t like loose ends. With the exception of the Corvette! The Sensuous American subscription series (see the “About Us” section) I’d not thought of these as “collector” books, especially the Corvette Black Books. They were used and replaced as new information was continually added. But a collector market is emerging, perhaps coinciding with publishing’s transition to electronic media. I didn’t have the foresight to retain much out-of-print inventory. Who knew? But I did keep a few, and am making them available here, in most cases for the first time in decades. Above are three thumbnail photos. Click them to see a summary list of books in that category. Then click on an individual book to get publication details, a bigger photo and pricing if copies are available. 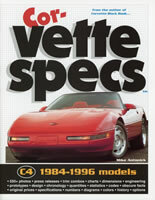 All were published by my company, Michael Bruce Associates, except for the Illustrated Corvette and Camaro Buyers Guides, and Corvette Driver-Owner Guide. These were published by Motorbooks. Books available and published by my company are genuine new-old-stock, brand new, never previously sold or circulated, and barely touched in most cases. Those from Motorbooks were commercially shipped to me and may show slight signs of handling. More valuable books are in archival mylar sleeves, and will be shipped well isolated in boxes. In the collector book market, scarcity and condition determine value. Here, prices range from $10 to $750 and may change at any time. Some editions are completely sold out and unavailable. We’ll do our best to keep quantities current, but this is strictly first come, first serve as inventory for some is down to a single copy.